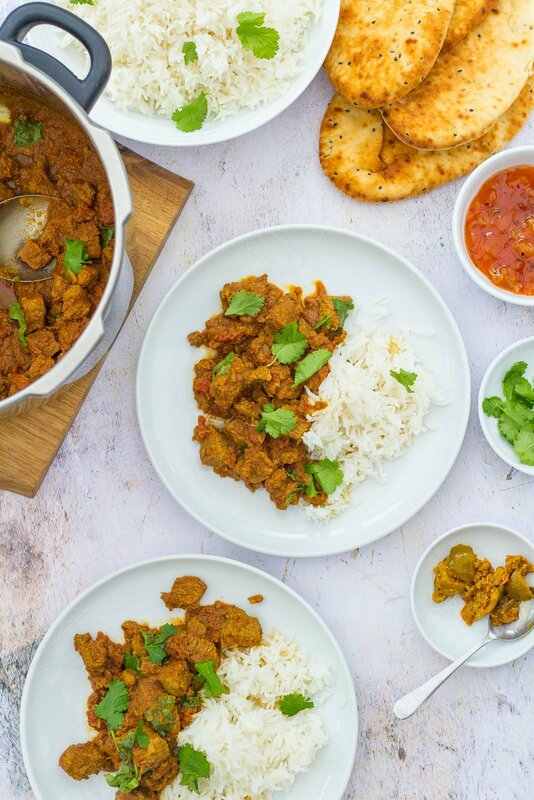 Beef curry in 40 minutes? Surely not possible? It is thanks to my new toy! 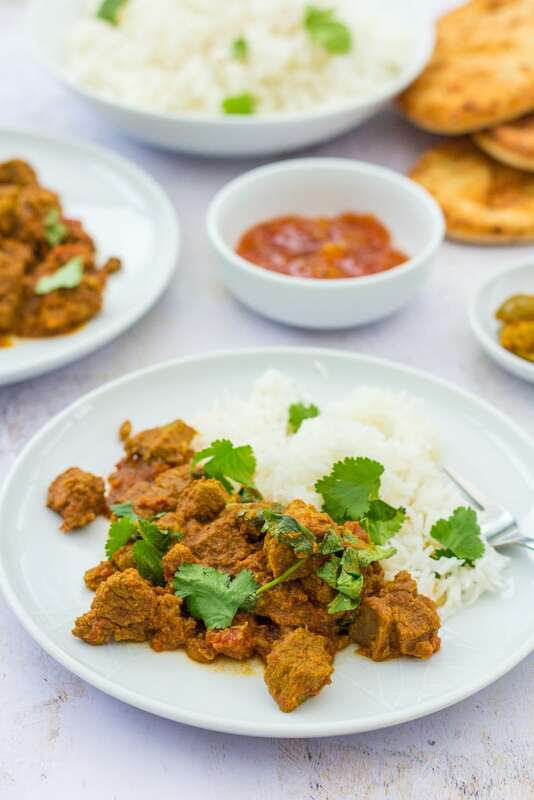 This Pressure Cooker Beef Curry tastes just like my slow cooked beef curries (the ones which take hours and hours in the oven or slow cooker), but takes just 40 minutes from start to finish – that’s faster than it takes to get curry delivered from my local curry restaurant! OK, so if you have been reading my blog for a while, you’ll know there are two things I really am passionate about when it comes to food: that it tastes great and that its quick, easy and faff free. 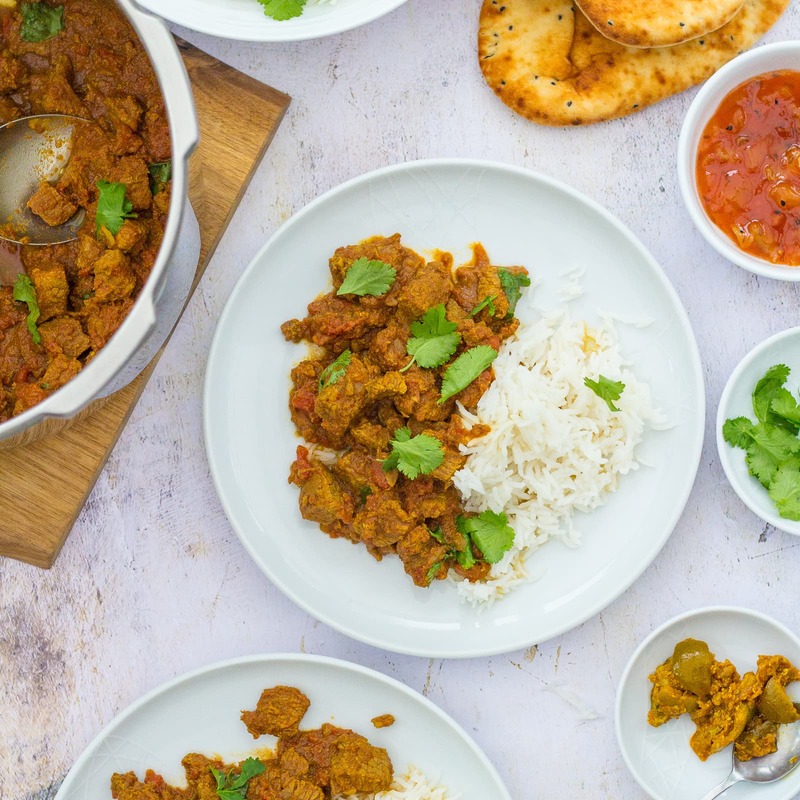 Annoyingly the two are often mutually exclusive – I love the flavours and textures of slow cooked stews and curries, and yes, they are generally easy and faff free… BUT they are most certainly not quick! 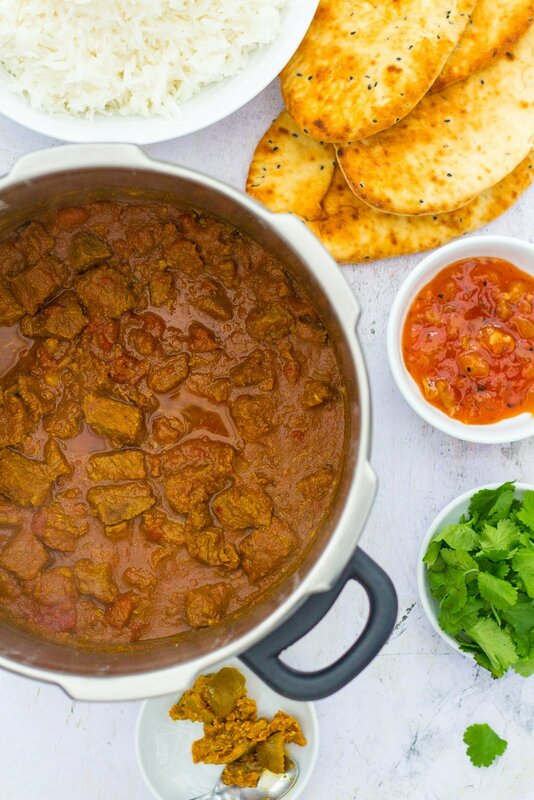 My Beef Bourguignon takes 3 hours in the oven, for example… Or there’s my gorgeous Lamb Bhuna… that takes 8 hours in the slow cooker!! Easy and faff free sure, but not meals you can quickly whip up on a busy school night on a whim! It takes planning and preparation and our busy lives don’t always allow for that… Honestly, the number of times I’ve had to change my plans because I was going to make a stew, but we got home too late!! How to get that slow cooked taste… but FAST! I’ve sort of known the answer to this dilemma for a while. I’ve been hearing for some time about a new breed of pressure cookers and their ability to do what a slow cooker does, but FAST! I liked the idea…but wasn’t all that convinced… to be honest it all sounded too good to be true!! That and my only real experience of pressure cookers was my Mum’s ancient pressure cooker which got used for things like Christmas pudding and steamed syrup sponge pudding. Things you don’t see much of on Easy Peasy Foodie! So what is it exactly? And how does it work? The Prestige Smartplus is a pressure cooker. The idea behind it is that the pressure cooker uses pressure to raise the temperature at which food cooks, which means food cooks more quickly. Cooking under pressure like this not only speeds up cooking, but it also means the food retains more freshness and those all-important nutrients. Which is a real bonus – especially when you are trying to feed fussy little people!! 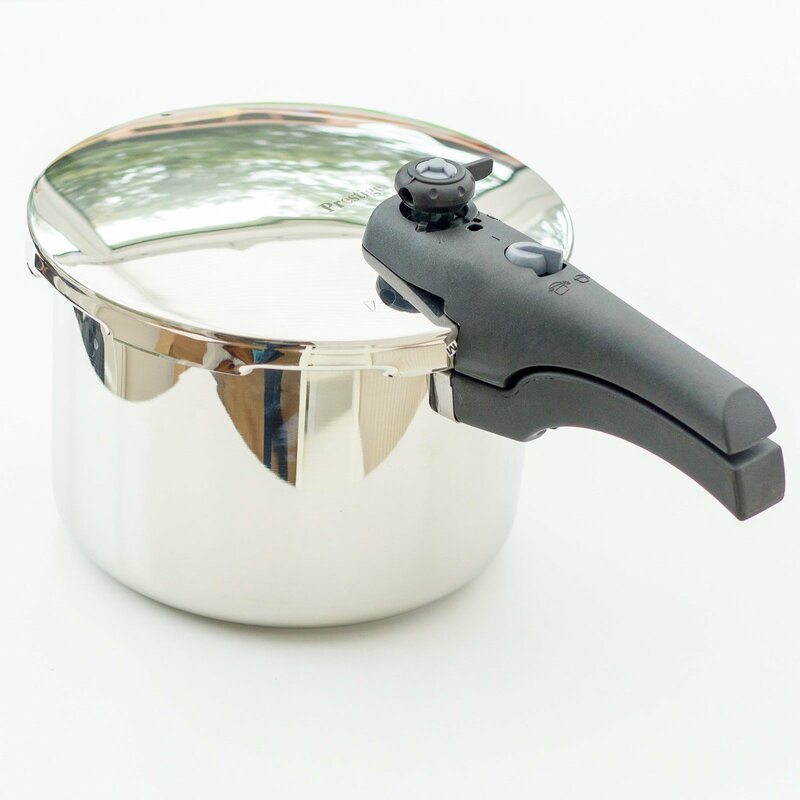 One of the things I was totally unaware of growing up with mum’s pressure cooker, was how the old-fashioned style of pressure cooker could be quite dangerous – especially if you lifted the lid too soon – it could seriously scald you with all that hot steam escaping – eek! Luckily the Prestige Smartplus has tons of safety features to make sure that doesn’t happen. There’s a visual pressure indicator to tell you when the pressure cooker is at pressure and when it’s safe to open. 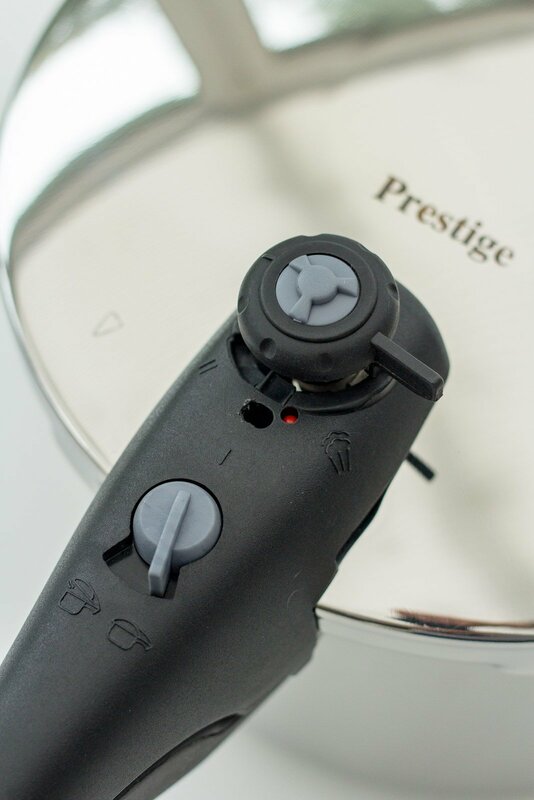 There’s a directional pressure regulator to ensure that the steam is released safely AWAY from you and the smart lid locks into place, so you can’t accidentally open it at the wrong time. Well you know me – when I’m given a new gadget to try, I like to put it through its paces PROPERLY by giving it a challenge that will test all the claims. I decided a beef curry would be a good way of testing out my new toy. First of all, stewing beef is pretty vile if it’s not cooked correctly – usually that means 3 hours in the oven or 8 hours in the slow cooker, to achieve that melt in the mouth, soft and tender slow cooked beef that I just love! Second, I always find a curry really needs a good long slow cook for the flavours to develop. 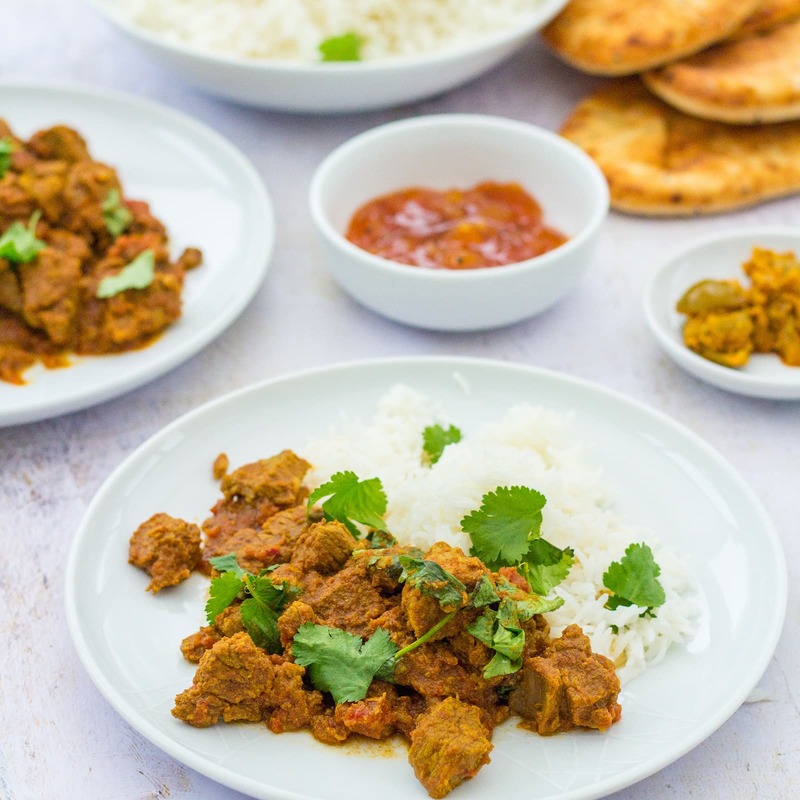 Yeah sure, I do do some quick curries – but the flavours are not a patch on the flavours of a curry that’s been cooking all day in the slow cooker… well until now, that is! I made my Pressure Cooker Beef Curry in a similar way to how I make all my curries. I started by frying onions gently in the open pressure cooker to soften them, then I added the beef and turned up the heat to brown the beef, stirring frequently and then I lowered the heat again and added the garlic, ginger, chilli flakes and spices. Finally, I added a can of chopped tomatoes. So far pretty normal. Now under normal circumstances I would have then put the lid on and put the curry in the oven for 3 hours or tipped it in the slow cooker to cook for 8 hours on low. Instead what I did was pop the pressure cooker lid on, selected the pressure I required (high / pressure 12lbs / dial set to II) and waited until the little red indicator popped up to tell me that the pressure cooker had reached the right pressure. Once the steam was escaping at a steady rate, I then turned the heat down until I could just hear a gentle hiss. I then left it for 25 minutes to do its thing. When the 25 minutes were up I simply turned off the heat and moved the dial to select fast release of steam (which safely released away from me, just as promised) and waited until the visual pressure indicator to drop before opening the lid and serving up! I was really impressed straight off with how the curry looked after such a short time in the pressure cooker, just like a slow cooked curry would… but the thing I was really interested in was the texture of the beef – if you don’t cook stewing beef for long enough it’s really tough and chewy and quite unpleasant tasting. I was actually quite sceptical about this part – I was sure it wouldn’t be as tender as slow cooked beef – how wrong I was! It was absolutely that soft, tender melt in the mouth texture you expect from slow cooked stewing beef, but cooked in a fraction of the time! I was properly bowled over by it. And of course, the curry itself tasted wonderful – very much that curry taste that you usually get from slow cooking, where all the spices have softened and melded together beautifully. It was a real hit with the family too! 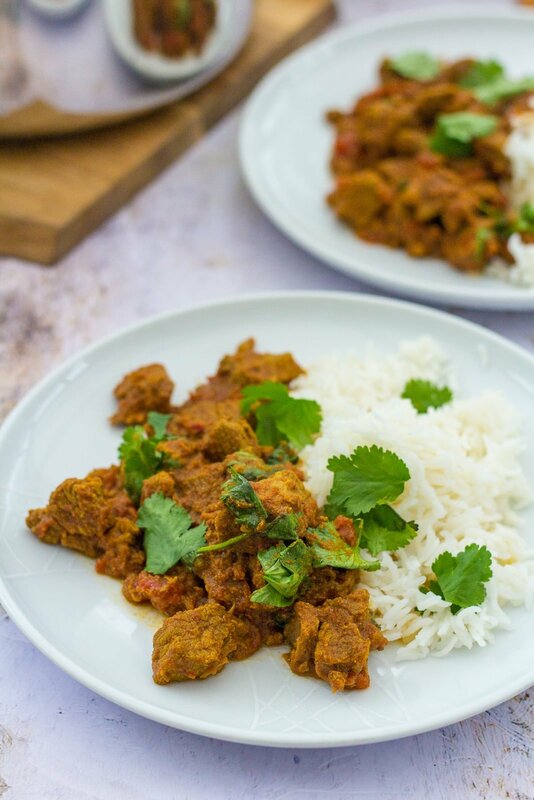 My kids, like most kids, are not a fan of ‘chewy’ meat, but absolutely loved the soft texture of the beef in this curry. A definite thumbs up!! Not only does cooking in a pressure cooker mean super tasty food FAST, but it’s also great for locking in freshness and nutrients AND great for the cost conscious – stewing cuts of meat are usually much cheaper! It’s also only one pan to wash – which you know I love! And the body can be put in the dishwasher, with only the lid needing to be washed by hand – a real bonus!! What else can you cook in a pressure cooker…? Place the onions and olive oil in the pressure cooker and fry over a gentle heat for 3 minutes, or until softened. Turn the heat up and add the beef – stir-fry for 2-3 minutes until browned. Lower the heat again and add the garlic, ginger, chilli and spices. Fry gently for 2 more minutes. Add the tomatoes and a little salt and pepper, then put on the pressure cooker lid and ensure the dial is set to high pressure (12lb / II). Turn the heat up high. Wait until the visual pressure indicator (red button) pops up. Then, when steam is escaping at a steady rate, turn down until the steam is making just a gentle hiss. When the cooking time is over, turn the heat off and move the pressure regulator to the ‘steam release’ position and wait until the pressure indicator (red button) drops. Open the pressure cooker, stir in the fresh coriander and serve the curry with rice, naans or chapattis and all your favourite pickles and chutneys. If you don’t own a pressure cooker, you can cook this curry in a conventional oven for 3 hours at 160C or a slow cooker on low for 8 hours. I am linking this up to Cook Blog Share, Cook Once Eat Twice and Recipe of the Week. 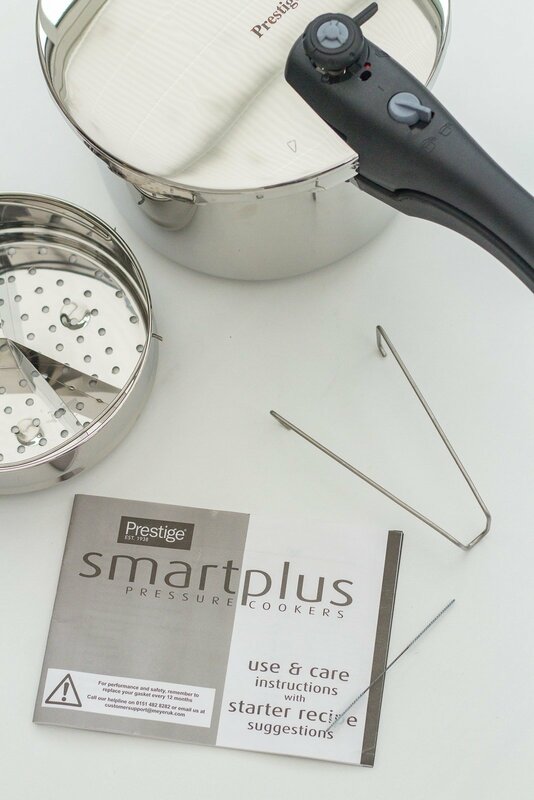 For more information on Prestige Smartplus Pressure Cookers, fab tips on using your pressure cooker and more pressure cooker recipes (featuring Stacy Solomon), check out the Prestige Website or follow them on Twitter/Facebook @yourprestige and Instagram @yourprestigekitchen. And don’t forget to share your fab pressure cooker creations using the #nopressurecooking hashtag! This curry sounds fantastic Eb! Slow cooking is definitely best for curries so it’s great that you can get the same results using a pressure cooker. I’ve been thinking about getting one for over a year now. It would be so useful and perfect for a lot of the recipes I make although I’m not sure I’ve got the space for another gadget! Thanks for sharing with #CookOnceEatTwice! I got back into pressure cooking precisely because of Indian food: one of Madhur Jaffrey’s cookbooks finally convinced me. It’s now one of my go-to methods for weeknights! I like that the Prestige Smartplus Pressure Cooker is a stovetop model: you get total control over the heat, and it’s so much easier to clean than the electronic variety. 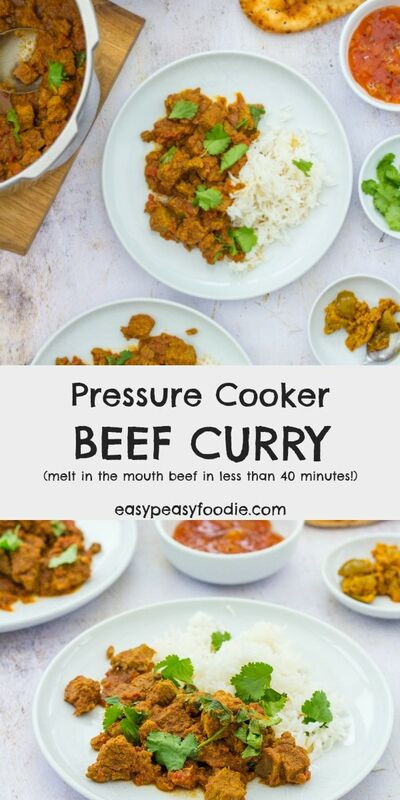 Your pressure cooker beef curry has such wonderful flavors going on: I can’t wait to try it! I don’t think I’ve ever had a beef curry before. It looks so delicious and hard to believe you can have such a tasty looking curry in less than 40 mins! YUM! The Peas love a curry and a pressure cooker is next on my kitchen gadget list!